That’s what I thought when I stared into the mirror one morning in early February this year, rubbing the sleep out of my eyes, scratching a day’s stubble (increasingly and frustratingly grey) on my jaw. On your 30th birthday, you can fool yourself into thinking your 20s aren’t that far away. At 40, you start thinking about exercising more because middle age seems to be upon you. At 50, there’s no more fooling yourself. In the mirror, I met my stare and thought that fifty years was a definite age statement. Still, it wasn’t something I dwelled on for long. I’ve never given much pause to birthdays or my age. There’s nothing I can do about it, so why waste a moment to worry about it? But with this one looming for the preceding year, it seemed like an excuse to do something fun, a ceremony to celebrate the big, round number, the fiftieth circuit of the sun. Truth be told, at the suggestion of my wife, Kate, we had decided on a trip to Caledonia the previous summer. Scotland is my favorite place on Earth. 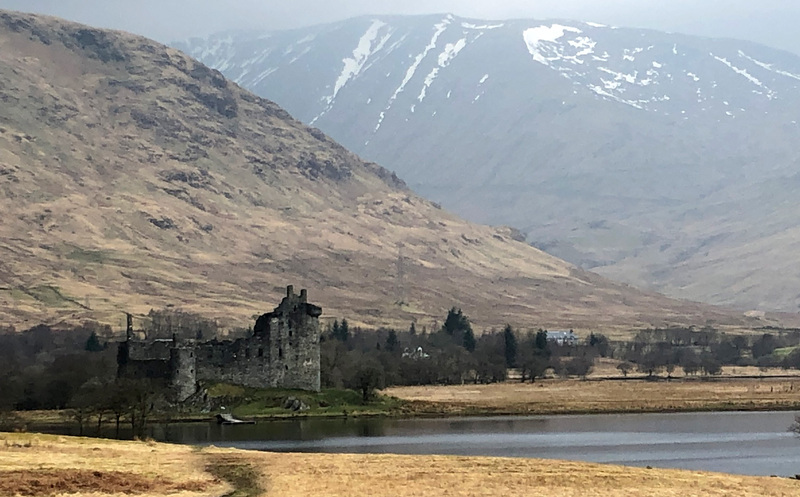 With friendly people, remote and sparsely populated villages, and rugged and beautiful nature, it’s everything I want in a destination; their many scotch distilleries are a welcome extra. I spent months planning the trip. 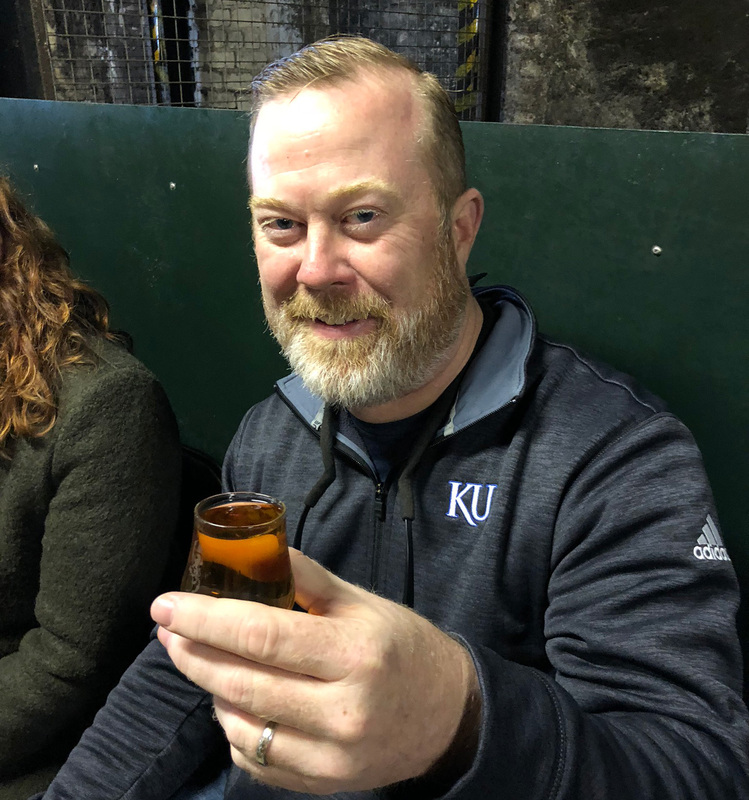 I poured over message boards, comment sections, blogs, and anywhere else someone talked about visiting scotch distilleries. I read Iain Banks’ Raw Spirit and dog-eared Michael Jackson’s Malt Whisky Companion. 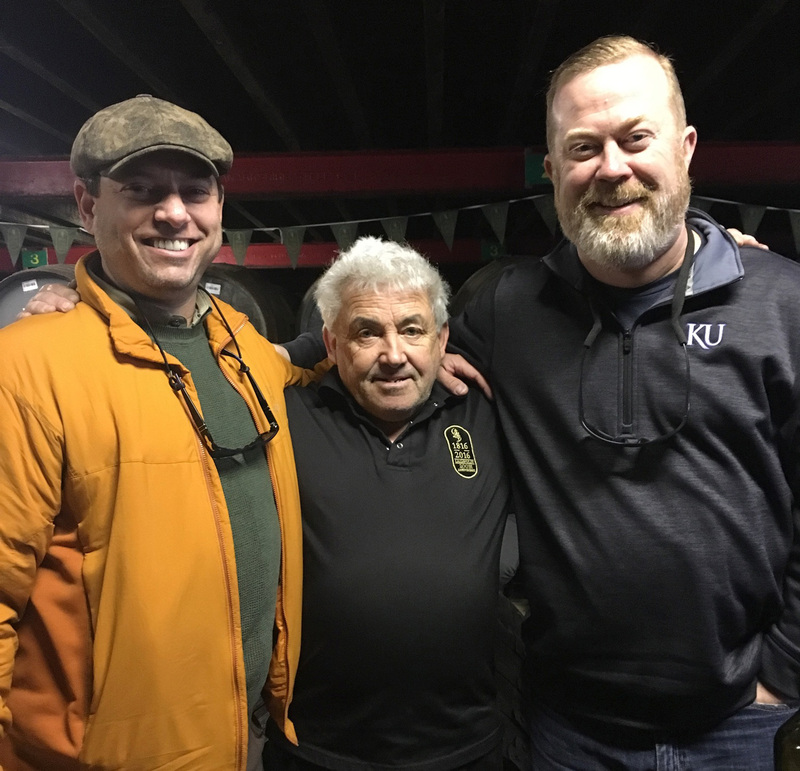 The planning was important because we only had a week and I wanted to compress as much in it as I could, while visiting the homes of some of my favorite whiskies. Knowing what I desired in advance was integral to getting into every tour I wanted and trying to head off any potential missteps. 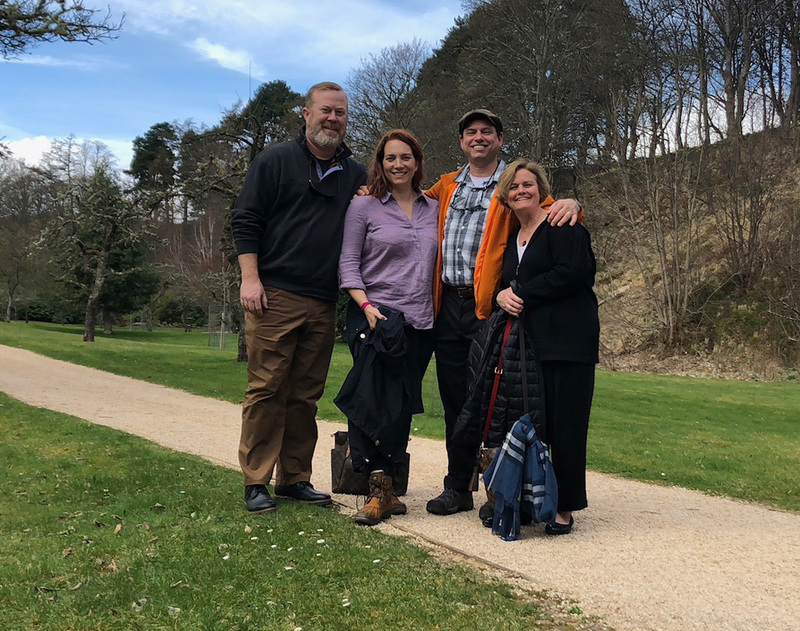 And so it was, in mid-April of 2018, Kate and I, and our friends and neighbors, Jon and Meredith, drove to the airport to head to Scotland in search of malts. The only picture we took of all four of us at once. At Glen Grant gardens. Perhaps we should have known better, booking flights on Friday the 13th, but an early morning text alerted us to potentially disruptive weather in late afternoon. A quick check showed hail, high winds, and possible tornadoes around our 5pm departure. So we rebooked for a noon flight and enjoyed some panic sweats as we packed our bags in a frenzy, a task we had previously planned for early afternoon. We arrived at MSP early afternoon and settled into an eight-hour wait before our scheduled 10pm flight. As a side note, Minneapolis has an absolutely beautiful airport. It’s wide open and clean, with a nice selection of shops and restaurants and when I walked in the bathroom, I swear that I might have heard angels singing. There are plenty of worse places to be stuck for a long layover. Unfortunately, almost the whole time we sat there, snow was falling in the Twin Cities. I don’t know what the final accumulation was, but 10-14″ was predicted and, as we boarded the plane, ice covered the windows. No worries though. Big, transoceanic flights get priority and we de-iced before heading out to the runway … where we sat for an hour and, just before taking off, were forced to go back to de-ice again. The whole thing set us back almost four hours. 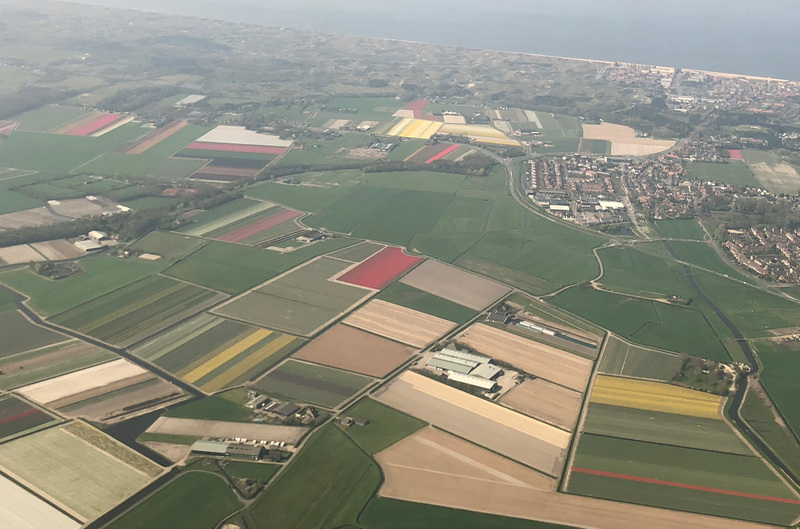 That, of course, meant we missed our connection in Amsterdam to Edinburgh. It also meant that we lost our (nonrefundable) hotel reservation in Edinburgh for the first night. Thankfully, we were comped a hotel in Amsterdam and, upon arrival, set out to explore that city a bit. Our first stop was Anne Frank’s house, but tickets were sold out for the day, so we moved on. We walked around the Red Light District for a while, smelling lots of marijuana smoke and seeing lots of head shops, but spent more time in the cheese shops than anything else. One of the more popular ones seemed to be Henri Willig‘s which proudly boasted about being around since 1974. Youngster! We half-heartedly looked for the prostitution houses we had heard about — just to see them, of course — but never found them. Instead, we stopped and had beers and shared a cheese board at a cafe with seats on a bridge over one of the city’s many canals. It was picturesque, but brisk, so we quickly moved on. We also walked by the flower market, but it had closed for the day. Still, through some doors, we saw buckets and buckets of tulips and irises and violets and roses in almost every color imaginable. After that, we found a restaurant in Pijp called Ginger that had delicious rack of lamb and very good beer. Then it was back to the hotel and sleep in anticipation of arriving in Edinburgh, a day late. We struggled a bit with the time change and were up way too early, but eventually caught the shuttle back to the airport. After passing security, we stopped for coffee and a pastry beneath an amazingly unique and fun clock in the food court area of the Schiphol Airport. At first, it appeared the clock was undergoing some maintenance, but upon observation, it turned out to be a video — very clever! Next, we arrived at our gate and someone had vomited near the end of the moving walkway. We alerted a couple of airport employees, but no one seemed interested in doing anything about it (in the 45 minutes we waited there anyway), so we took it upon ourselves to warn people so they wouldn’t slip (as we saw several do as we talked to employees). Ridiculous. On the plane and then, finally, about 40 hours after leaving home, we arrived in Scotland. I’ve driven a fair number of times in England, Ireland, and Scotland and it’s a fairly easy transition. It just requires a bit of thinking before making a turn — for the first couple of days anyway. We set north from the airport on wide roads and highways, a welcome beginning to our journey by car. Multi-laned roundabouts require split-second thinking that borders on advanced calculus to me, commitment to arteries that will spit you out at the proper exit … and I butchered them time after time. Stupid American! We somehow made it safely to Falkirk and the Falkirk Wheel, a rotating boat lift that lifts boats and a tub of water from one canal to another — 80 feet in the air, like a giant, two-cabin Ferris wheel! The concept of a boat lift isn’t unique in the world — there are many to be found — but Falkirk’s unique approach and its energy efficiency (a single turn uses the same energy required to boil just eight kettles of water) make it an engineering marvel. 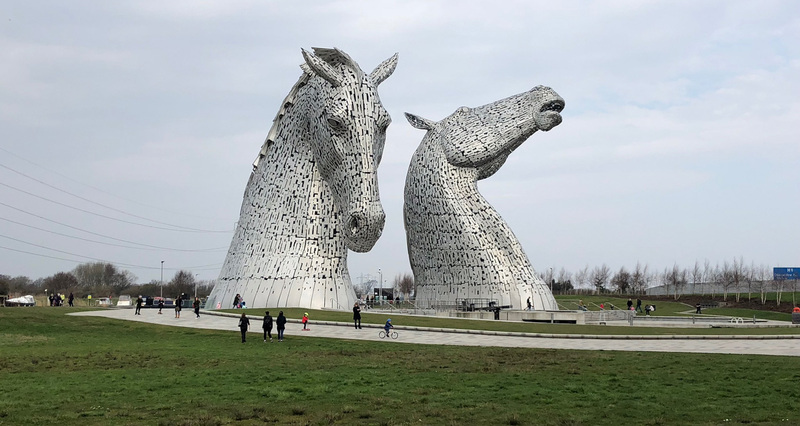 After that, it was on to the Helix to see the Kelpies, a pair of metal-clad horse heads rising 98 feet above the Forth and Clyde canal. Not only do they celebrate Scotland’s horse heritage, they are also a nod to the mythical water spirits found in the country’s lochs and rivers. Parents would tell their kids to stay away from rivers and canals, lest the kelpies drag them down and drown them. National Wallace monument in the distance. The next stop of our first whirlwind day was Stirling Castle, just up the road. The former royal residence is the largest in Scotland and one of the most important, historically. From one side of Castle Hill you can see where the Battle of Stirling Bridge was fought, from the other side, the Battle of Bannockburn. Both battles were part of the First War of Scottish Independence. 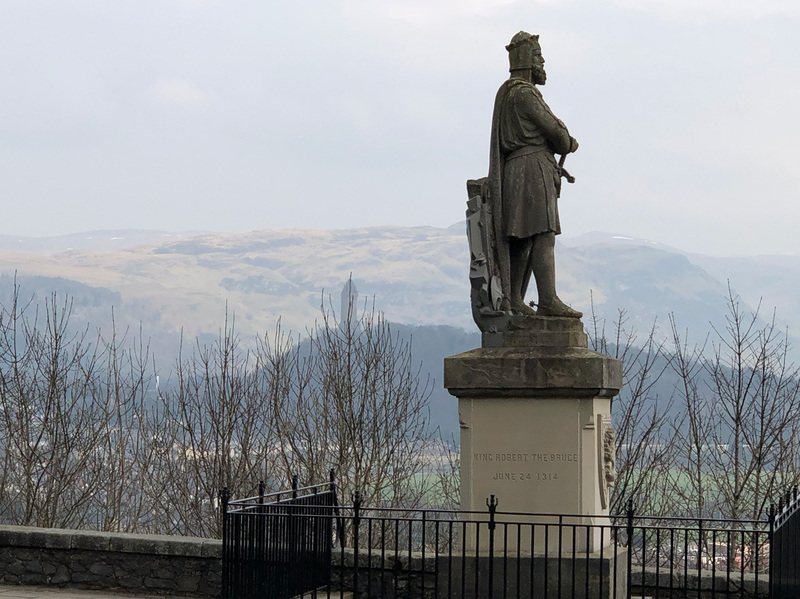 The weather was breezy but beautiful and we could see the National Wallace Monument in the distance, past our view of Robert the Bruce’s statue at the castle’s entrance. 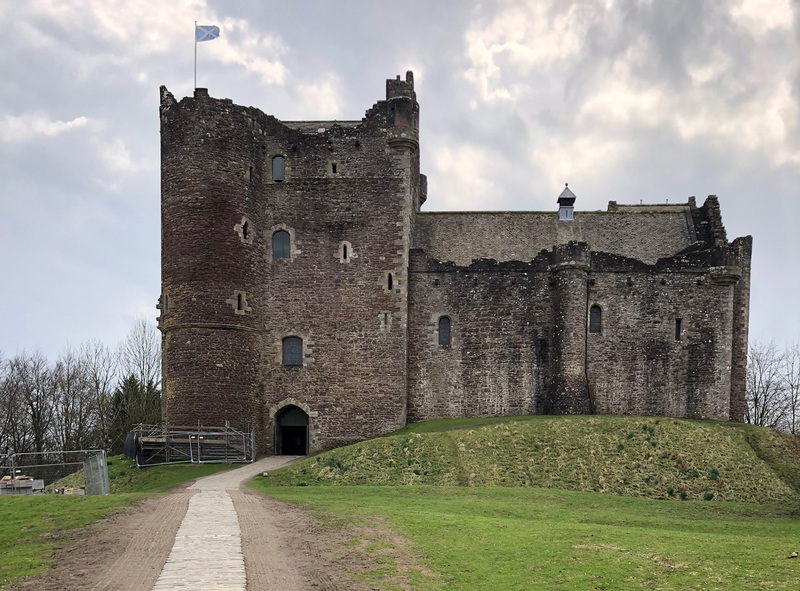 It was almost time to begin our trek to the coast, but we wanted to make one more quick stop, at Doune Castle. It’s thought to be at the site of an early Roman fortification and was built (in its current state) in the late 14th century. There’s lots of access throughout the castle, its courtyard, and grounds — but that’s not the real reason we had it on our itinerary. The castle was used for several scenes in Monty Python and Holy Grail, including the initial scene where King Arthur meets the French (“Fetchez la vache!”). 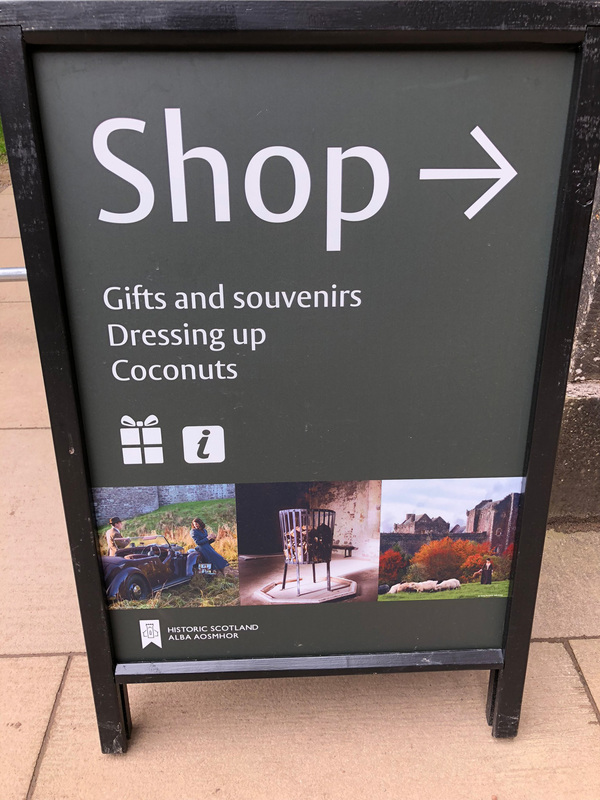 The interior of the castle was also used as Winterfell in the first season of Game of Thrones and it’s also been used for Outlander, but Holy Grail is what it’s best known for, as noted by the official Terry Jones audio tour and the fact that the gift shop sells coconuts. That’s on point! The day turned squarely to driving after that, 150 miles which took better than three hours thanks to Scotland’s aversion to roads that are straight for more than 100 yards. It was a beautiful drive though, with postcard-perfect vistas around nearly every bend. The final third of the drive was done in driving rain, which was certifiably harrowing for day one, given the number of huge, oncoming trucks straddling the middle stripe of already narrow roads. We finally arrived just outside Tarbeart at the Bluebell Cottage, a Bed & Breakfast I had learned about when planning this trip. [I mined the archives of /r/Scotch pretty heavily for ideas, lessons, and itineraries — also where I learned about the Bluebell.] Graham was our host for our first night in Scotland and he is a kind and soft-spoken Londoner who runs the B&B. We ran back to Tarbeart for supper, eating at the Anchor Hotel where a caustic and somewhat offensive Australian waiter spent too much time with us in his empty dining room. Then it was back to the B&B where a restful night ended too early as we had to rise early to make the 7am ferry to Port Ellen on Islay. We left our car and boarded on foot, knowing we would be drinking a fair amount over the next couple of days and the cost of bringing a vehicle seemed prohibitive if we would be taking taxis. The ship was large and newly appointed, one of the nicest ferries we had ever been on. 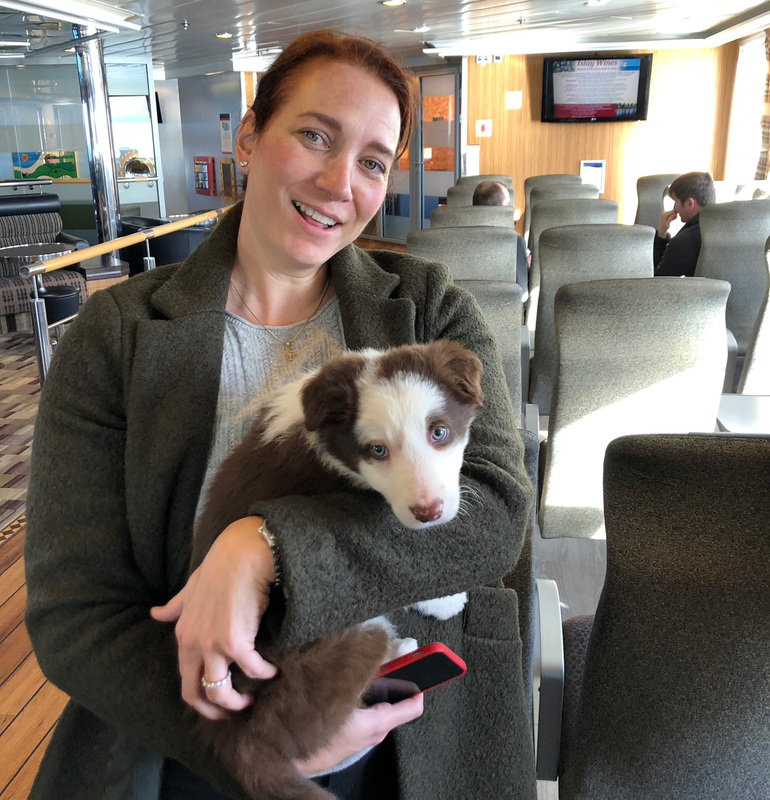 It was still very early in the season, so there were only a couple of other tourists on board; most of the others were workers headed to Islay for employment. The high point of the voyage was a tractor salesman who was delivering a vehicle to a farmer. He had also taken on the task of delivering an eight-week-old collie named Gus. The puppy was adorable and smelled uniquely, the way new puppies do, and none of us could stop from giving him a scratch behind the ears. 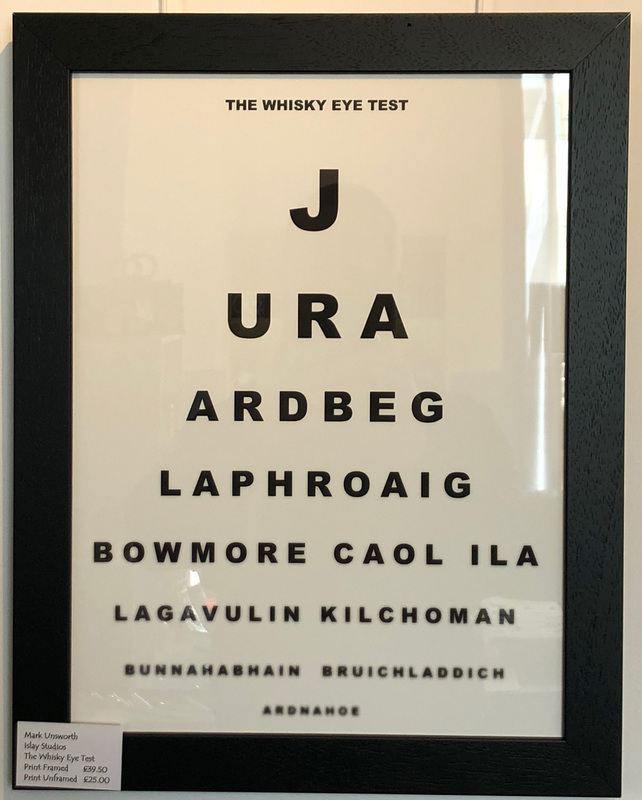 After a two hour journey, the inner Hebridean isle was in sight and on its shore we could make out the block letters adorning our primary destination of the day: LAPHROAIG. It was a very exciting moment that called for a bit of reflection. For years, I had run my finger over the inked addresses on bottles of scotch. I’d read about these far-flung and remote locations, but I never imagined I would ever visit. Yet, here I was, on a ship headed right toward the heart of my favorite scotch region. Islay is a small island, about 250 square miles and a population of just over 3,000. Yet, the island supports eight wildly popular distilleries with several more on the way. Islay scotches are generally characterized by their strong, peaty and briny flavors. Not all spirits there are characterized by this vaguely medicinal taste, but many are and it’s largely how the island is known. It was exhilarating to see the island come into full view. The ferry docked and we disembarked, walking just a block up to our home for the next couple of nights, The Islay Hotel. We dropped our bags and set off to kill some time before our first tour of the day. We had neglected to change the Euros we had from Amsterdam to pounds, so we grabbed a taxi up to Bowmore, about 10 miles away, where there was a Royal Bank of Scotland ATM and a few shops. It was a picture-perfect day, bright with sunshine, alabaster clouds smattering the sky, racing across the expanse as the North Atlantic’s ever-present winds hurried them along. 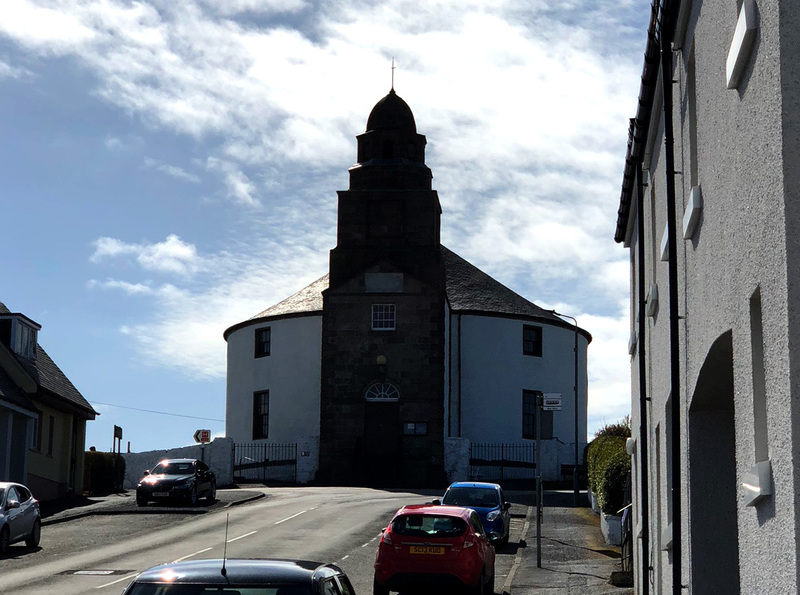 In Bowmore, we poked into a few shops, took in the Kilarrow Parish Church (round so the devil can’t find a corner to hide in), and grabbed a bite to eat before leaving our wives for our first distillery tour. We arrived at Laphroaig shortly before our tour was to begin. 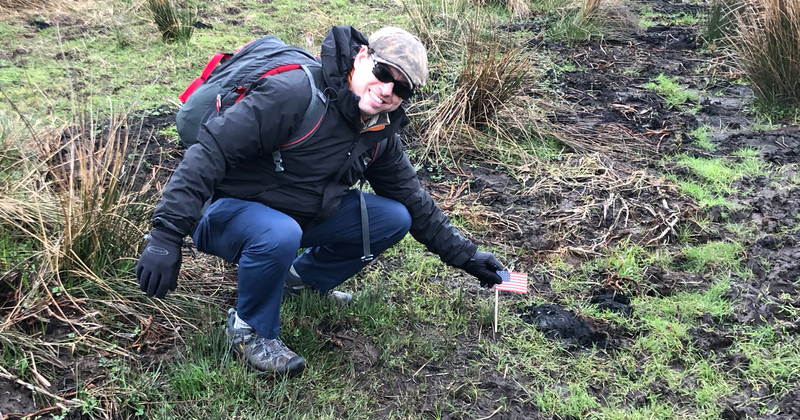 Across the road from the entrance, we spied dozens of flags planted in the ground, part of a program I knew about for the Friends of Laphroaig. Here, by registering, you can become a “landowner” in Scotland. Ownership bestows each individual an honorary one square foot of land. The catch is that you lease the land back to Laphroaig and they pay you with a wee nip of their whisky. The second catch is that you must visit them to collect your “rent.” It’s an amusing perk that we later learned stems from an interesting story. More on that later. 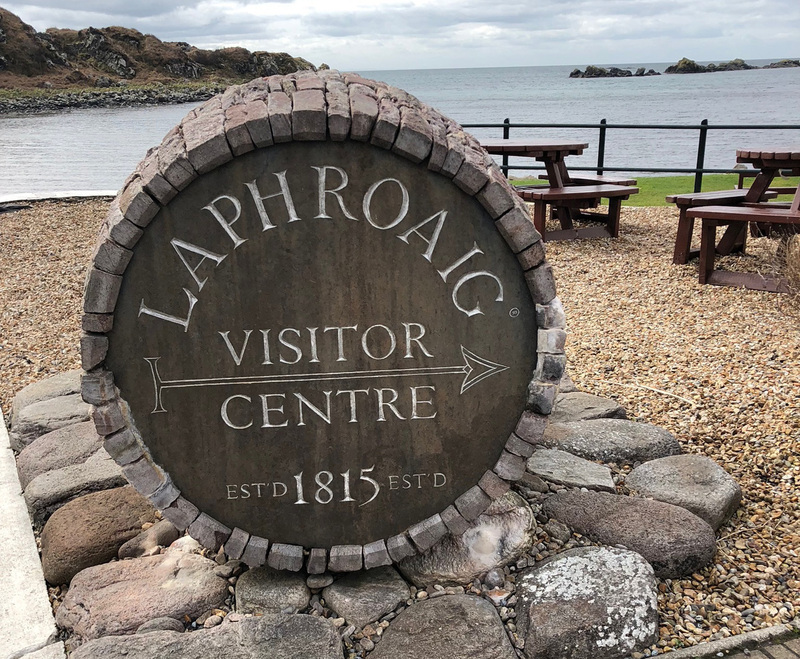 The entrance to Laphroaig is understated, with short rock walls lining the curved entrance on either side of the drive, a simple sign bearing their name in each center. Blocking the view of buildings is a thick wood packed with trees, which is fronted by a modern walking path that connects Port Ellen with the distillery before continuing on to Lagavulin and Ardbeg, each a mile (and another mile) further east. The company’s ongoing marketing campaign, Opinions Welcome, is evident throughout the distillery, both inside and out. 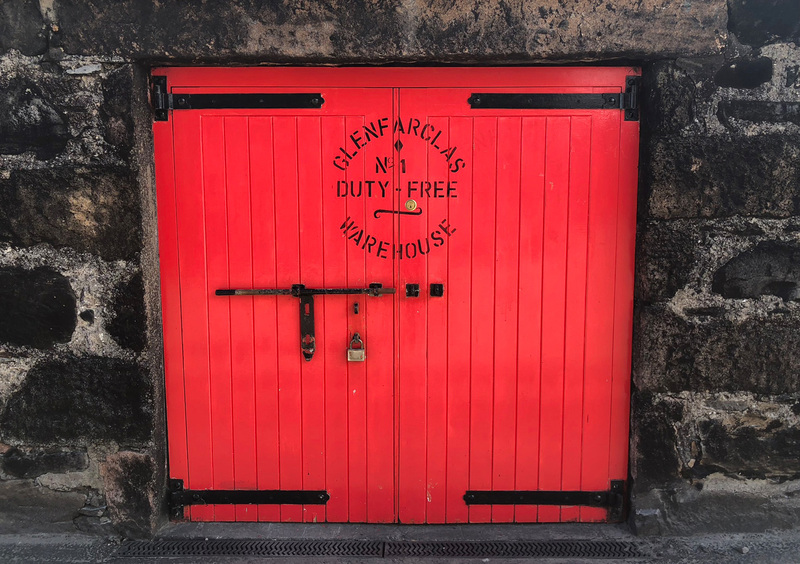 Customers are encouraged to submit their description of the richly flavored whisky and the best ones have been emblazoned on the company’s trucks, walls near the kilns, and on some of the building exteriors. These are clever and witty — descriptions like “Take an old boot. Burn it. Soak it in seawater. It tastes like that, but in a good way.” or “Smells like a zesty mouthful of Band-Aids. Tastes like a glorious battle between the Celts and Vikings on the beach.” or one of my simple favorites, “Tastes like a burning hospital.” These proclamations might come off as abhorrent to the uninitiated, but to true disciples, they are like passwords, proving testaments to Laphroaig’s punchy and peaty taste. We checked in at the Visitor’s Center, found next to a large, cask-shaped cairn. Inside, we paid our £100 for the four and one-half hour Water to Whisky tour. We were handed a small Glencairn on a lanyard and invited to visit the gift shop before stopping by their tasting center and sampling a small dram of the Laphroaig Select. 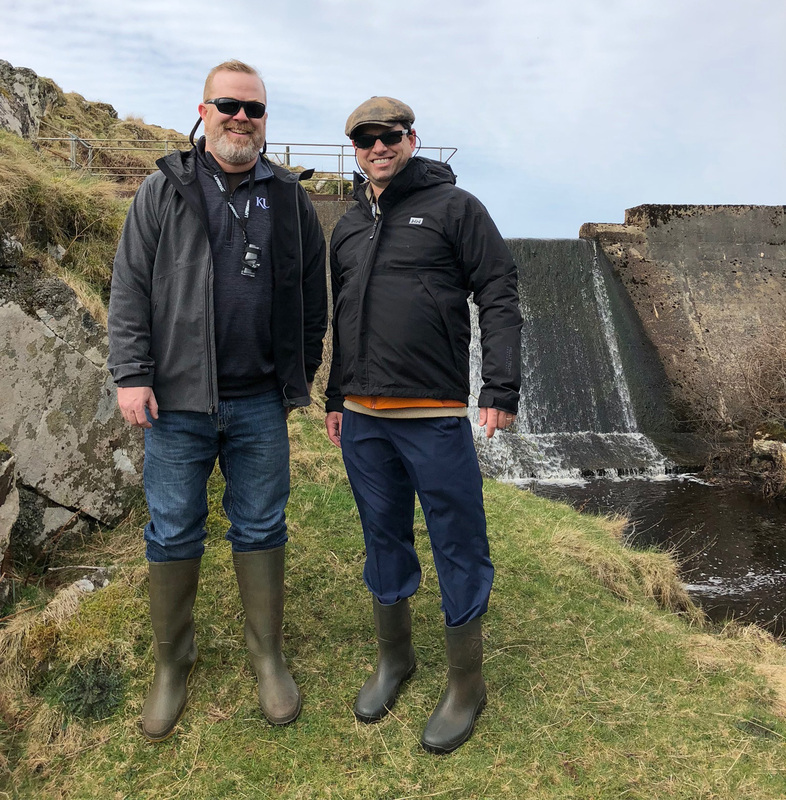 The weather was still smiling on us but the ground is almost constantly soggy on Islay, so we promptly changed into Wellie boots provided by the distillery and, along with four other guests, were driven out to the hills for a quick lunch. We parked on a farm road and trekked up a couple of hills, passing an ancient standing stone and more than a few sheep, some with new, spring lambs in tow. Looking south, the hills tumbled down to Laphroaig and the ocean beyond. At the rocky crest of the tallest hill, our guide, Gail, told us that if we looked east, we could make out the red smokestack of Lagavulin. 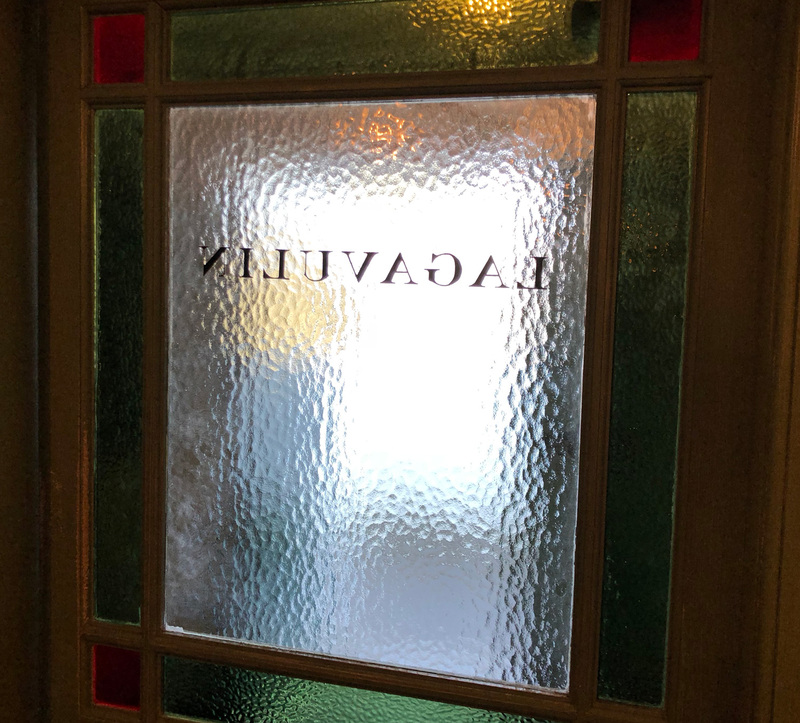 Gail then told us that in the early 1800s, Lagavulin was formed and recruited Laphroaig’s master distiller away in an attempt to copy Laphroaig whisky. 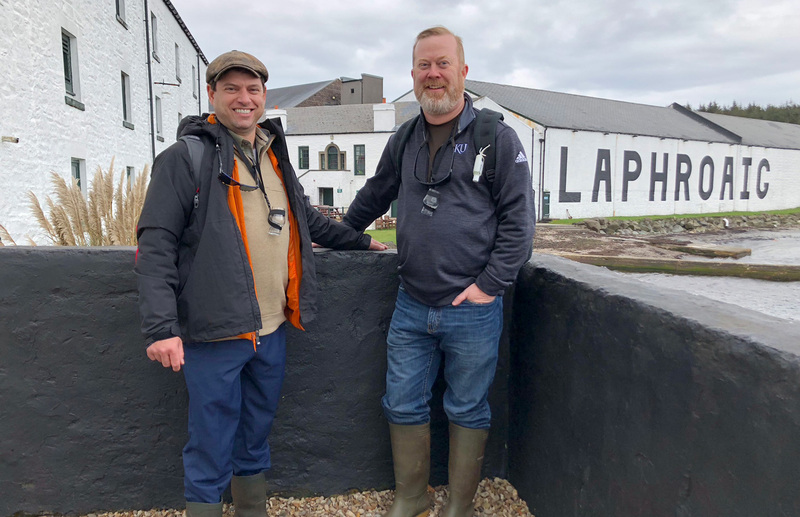 What’s more, they diverted Laphroaig’s water supply to begin their distillery. Water plays a key part in the flavor profile of each whisky and Laphroaig’s water is tawny in color, tinted by the peat it flows through as it works to the sea, a distortion that makes the spring water look almost like whisky before even reaching the distillery. Lagavulin’s divergence led to a six year court dispute, which Laphroaig ended up winning. Laphroaig subsequently bought up all the land around their water to prevent a future dispute and, as the story goes, began recruiting Friends of Laphroaig as landowners so that there would be a multitude of plaintiffs in any future court disputes. That’s the story, at least. Coasting down from the crest, we found ourselves in a small hollow next to a babbling brook. Here were the waters that flowed from the higher hills and made their way to Laphroaig where they were used to make whisky. The wind had picked up, but nestled next to the water, we found sanctuary and sat down to a gourmet lunch at a picnic table, purposefully placed for this tour. Opening our bags, we were treated with a mug of thick, creamy, homemade tomato soup, several small wrapped sandwiches, a tangy and delicious Laphroaig cheese, haggis balls, and Laphroaig fruitcake and shortbreads. It was delicious. The sacks also included complimentary Laphraoig water bottles, but as we chatted, we enjoyed a couple more small drams. That was the point of the tour, of course. After a short time, we hiked back to the van for the distillery tour. I knew, before boarding the plane, that all tours end up being about the same. However, Gail provided us with a great first tour. We worked our way from the delivery of barley to malting, fermenting, distilling, and maturation. Laphroaig is one of the few distilleries that still has a malting floor and malts some of its barley. Modern processes are far more efficient, but whether it’s for tradition or the tourists, it was great to see how barley is malted. 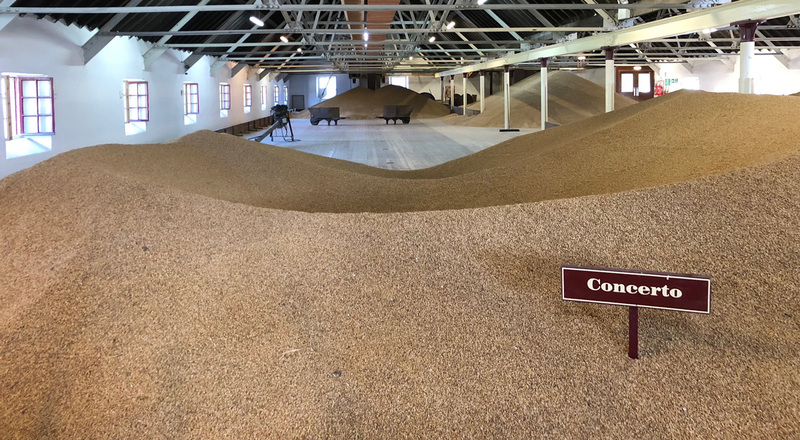 What’s more, it’s easy to imagine men turning the grain a hundred years ago, with peat smoke rising from the furnace below and salt air flowing through the open windows of the malting floor. We were treated to a snack of peated barley and it was delicious. I’m going to try to find some to add to morning yogurt. 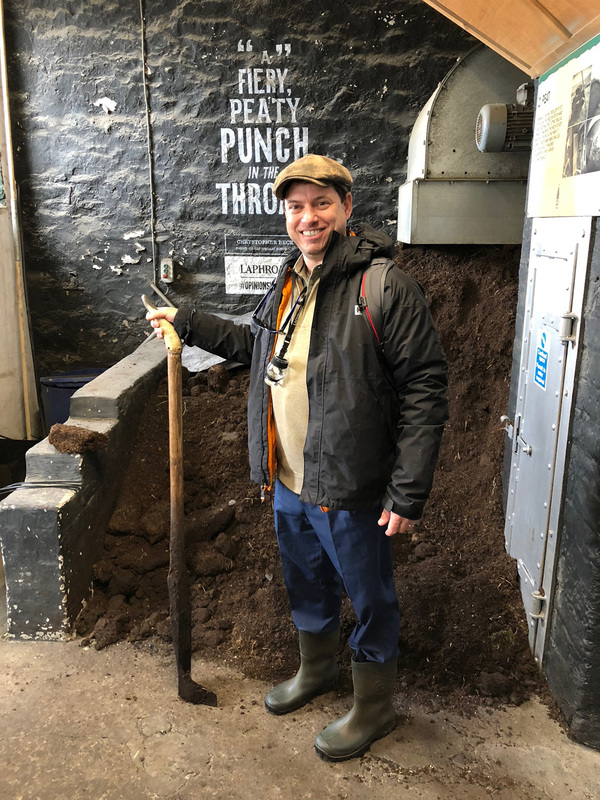 During the tour, we were told that about 60% of Islay is peat bogs and, that at today’s current use there is enough for about seven more generations to use. Peat only replenishes itself about 1 millimeter each year, so a solution may need to be found far in the future, lest Islay’s unique flavor be lost. 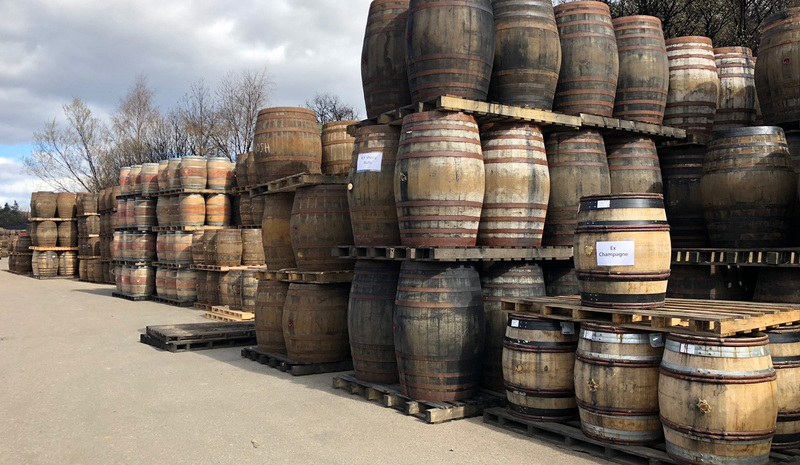 Further, a new distillery, Ardnahoe, is scheduled to open soon, Port Ellen is scheduled to reopen (it currently only malts barley for Diageo brands) and yet another one or two are on the horizon. To complicate matters, peat burning is said to be horrible for the environment, worse than coal, I was told. All that growth and the current popularity of Scotch means peat replenishment is a concern to some. 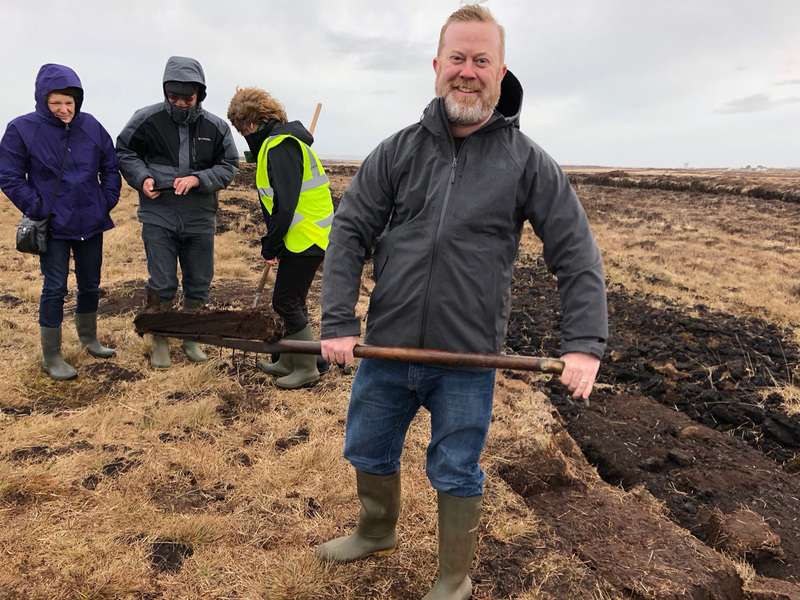 After the tour, we jumped back in the van and headed out to the peat bogs to cut some ourselves. The day had become very windy and getting out of the vehicle, hoods came up as we leaned into the blast. There were several employees out on the moor, cutting peat for Laphroaig, but we headed over to another area where the tourists had their turns. Seeing the efforts of those who had stopped before us was fairly sad. The blocks were skinny and anemic in the way that makes you think of Charlie Brown’s Christmas tree. At least the bar wasn’t set too high. Cutting peat involves removing the top couple inches of turf and placing it on the bare top of more recent cuts. This allows the turf roots to rejoin the land and keep growing. 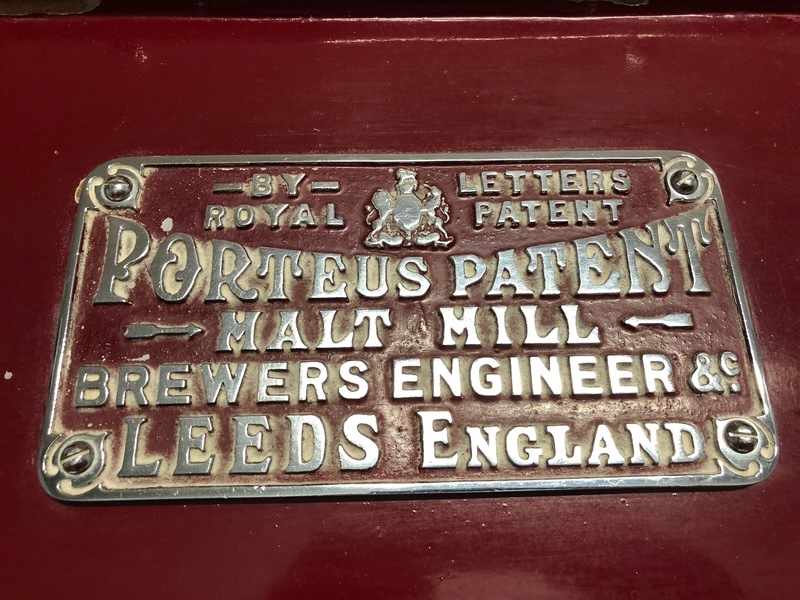 Any flat cutting tool can be used to remove peat, but the one we employed was a flat blade at the end of a thick shaft with a ram’s horn at the handle end. Extending perpendicular to the shaft and at the business end was a sharp prong, which helped hold the cut peat in place. This piece of equipment is known as a peat iron, or tarasgeir in Gaelic, and while there is some variety to their shapes and design, they are widely similar. We each cut, simply placing the tool on the earth at about a 75º angle and driving down. The peat is soft, so cutting is easy and a quick flick of the wrist holds it on the tool. Typically, the peat would then be stacked so that it can dry and later be used as fuel. Commercial peat cutters can cut in an hour what it takes an individual a week to do by hand, but Laphroaig says they prefer to have the peat cut by hand since they believe commercial cutting compresses liquids from the peat, which are responsible for much of the peat’s flavorful smoke. When it was my turn, I took the tool and stepped down a level, just above where I was to cut. There was a last piece to be shaved off, on the outside edge, and I positioned the blade just behind it. I adjusted my angle and drove down, cutting through the earth like a knife goes through refrigerated butter. It was a lot easier than I had imagined and, as Gail reached for a pitchfork to hold the peat on the tool, I gave it a quick flick and brought it up to waist height. Easy, I thought, and then looked down at my effort. Charlie Brown would have been proud. Oh well, everyone only got one crack at it and I think, with another turn or two, I could carve off handsome blocks in no time. But there wasn’t that chance, so I laid mine down with the others. That task complete, we headed back to the distillery one last time. After a short break, we headed over to the warehouse where we tried three cask strength whiskies, right from the barrels. They were from three different years, a 12, 13, and 15 and whirling the whisky in our glasses, we could see some of the char from the casks, which are fired before accepting spirit. After sampling, we were allowed to pick our favorite to bottle and take home. The warehouse concluded our tour and we headed out to plant our flags and claim our land as friends of Laphroaig. As we officially became Scottish landowners, the rain began to fall — a fact we found exceptionally fitting. We pulled our hoods up and began the walk back to Port Ellen. The rain wasn’t too heavy but we were damp by the time we made it to the hotel. We had a few drinks before moving on to dinner in the hotel’s dining room. One appetizer of note was the Blaggis Burger, a delicious mix of black pudding and haggis. Ending the day, we retired to rest for day two on Islay. Thankfully, Laphroaig had metered our drams nicely. We were feeling fine when we got up the next morning, which was good because we had a long day ahead of us. On the day’s itinerary were four stops. First was Lagavulin for their distillery tour, followed by the fabled warehouse tour with Iain McArthur. Next was lunch at Ardbeg followed by a trek to the north end of Islay to visit both Caol Ila and Bunnahabhain. We would be joined at Lagavulin and Ardbeg by the ladies (before dropping them in Port Ellen on our way north), so we had arranged for a driver, Hughie, to drive us this day. After a hearty, full Scottish breakfast, we jumped in the taxi we had hired for the day and followed the road to Lagavulin. Their 16 year double maturation is one of our favorites (as it must be for many people, judging by its jump in price a few years ago), so we highly anticipated this visit. Their visitor’s center felt like stepping into history. Unlike many of the other distilleries, the Lagavulin waiting area felt like it hadn’t changed in a century. Sure, it had a small store and modern toilets, but the lower ceilings and comfortable seating area — in a living room-like setting — felt like the same office that the distillery had been using forever … in a good way. Glancing in their book, I was pleased to see that the tour was only to include eight people, which is a perfectly sized group in order to hear everything the guide shared. This blessing was dashed when a dozen Swedes and Germans showed up and joined us at the last moment. Not to begrudge them, but large groups make it very difficult to get a good tour since working distilleries can be quite loud. As a result, we missed a good portion of what was discussed on the tour. The other downside was that Lagavulin, like our impending afternoon stop at Caol Ila, didn’t allow any indoor photography. Thanks Diageo! The reasoning behind this escapes me since anyone could walk in and take the tour and see whatever they wanted to see. The tour was a quick march from grinding to fermentation, stills, and to the water, outside. It’s worth noting that the process, which used to require dozens of men now operates on a skeleton crew — a fact that’s true of all the distilleries these days, thanks to automation and the outsourcing of malting. We finished outside with everyone taking a photo of the bayside warehouse with the brand’s large lettering facing the bay. A few of our group left to enjoy their complimentary dram. The rest of us, joined by a few others who had just showed up, headed into the warehouse tour. Here, in a small showcase warehouse, whisky legend Iain McArthur held court, talking about scotch and sharing cask strength drams with us. He is a practiced showman and very entertaining. I later learned at another distillery that his nickname is Pinky, which makes sense, given his diminutive size. On the menu were five whiskies. We were given a smaller Glencairn and we sampled a 2012, 6-year old at 61.6% ABV, 2004/14/52.1%, 1998/20/52.4%, 1993/25/49.8%, and 1982/36/53.5%. McArthur drew the first from the cask, using a valinch, a tool like a whiskey thief, essentially a large pipe, to pull the straw-colored liquid from the barrel by using his mouth to suction the whisky up the tube. (We learned here that Lagavulin uses caramel to color its whiskies, which was, frankly, a little disappointing.) One of the Swedes had the opportunity to try to draw from the second cask, but didn’t do a very good job, much to the amusement of the crowd as McArthur good-heartedly abused him in his futility. Kate, Meredith, and Jon took on the third cask and, since I wasn’t involved, McArthur filled my Glencairn to overflowing. Maybe it was because someone had mentioned this was my birthday trip to him. Maybe because he just enjoyed his role as party master. Regardless, it was a lot of whisky. It was all very, very fun and it went fast. Five cask strength whiskies in an hour is a lot and, by the end, we were spinning more than a bit. McArthur ruled the room and made the warehouse tour a very charming and compelling visit that everyone should have on their itinerary. However, our adventure wasn’t over. Just before wrapping up, Jon asked McArthur what the oldest cask they had in the warehouse. McArthur turned on his heel and walked over to a lone barrel and said “This 1966 right here. And the only person getting any is the birthday boy, so no one else even ask for any.” I grabbed my Glencairn and stood up, a little numb to what was going on. I was about to try a 52-year-old scotch, the oldest I’ve ever had. Ian filled the glass generously and I thanked him with a raised glass and received a “slàinte mhath” in return. The taste was very nice, quite a bit more mellow than the others, and I shared sips with Jon, Meredith, Kate, and Scott, an enthusiastic scotch lover who lived outside Washington DC and who we had been chatting with. While it was a wonderful experience, the 52-year-old wasn’t a game changer. It’s said that a whisky’s age reaches a point where there are diminishing returns and I think that probably applies here. 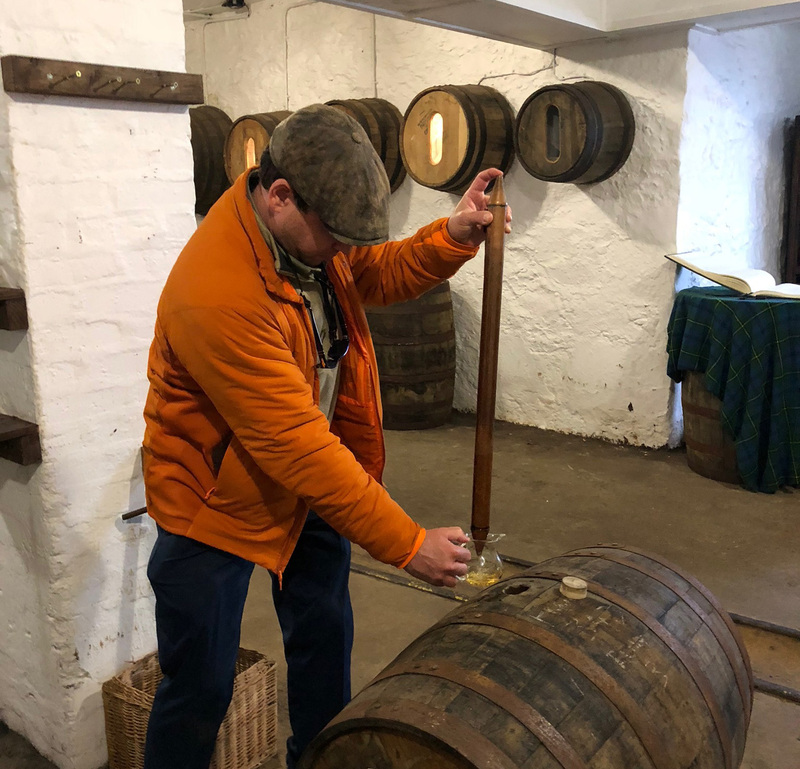 Not to mention that while I’m positive that was the oldest cask in that particular warehouse, it may not be the oldest in all of their warehouses and if it were a great whisky, they wouldn’t be giving it away to the tourists. Still, I thoroughly appreciated the gesture and had a wonderful time during what turned out to be our most entertaining tour. That said, I will honestly call ourselves well on the way to drunk as we headed out to the van to drive over to Ardbeg for lunch. The Ardbeg distillery is known for having a good cafe, as was evidenced by the number of people there for lunch. In fact, we ran into Scott and his wife there, which was a pleasant surprise. I got haggis, nips, and tatties, which came with a dram of Ardbeg. (Admittedly, I only had a sip of that. I recognized I needed to clear my head a bit before heading on to the next two distilleries.) The food was very good and, before we knew it, we were on the road again. 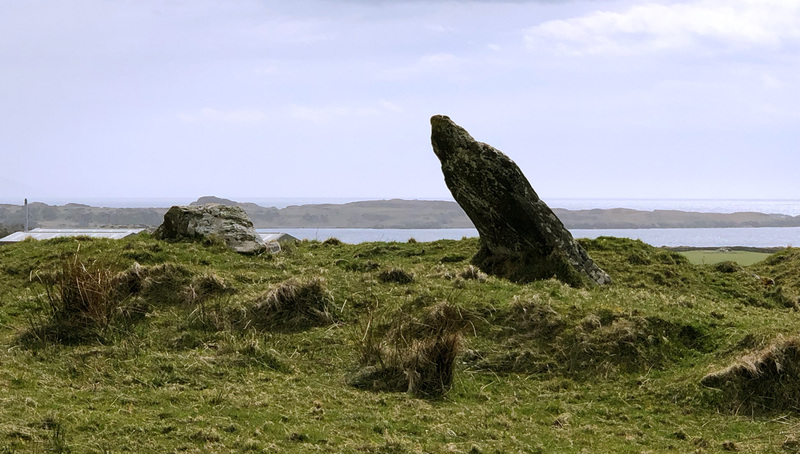 We dropped the girls off in Port Ellen and then Jon and I began the trek north, along a single-lane, heavily patched road that roughly bisected the island. Our driver, Hughie, was friendly but quiet as he took us past sheep farm after sheep farm, past peat bogs and rocky outcroppings. For as legendary as Islay is, it’s fairly featureless. The web tells me that Beinn Bheigeir, the island’s highest hill, rises more than 1,600 feet above the waves, but there is little flora that grows above the height of a man and buildings are few and far between. Maybe when the heather blooms and the gorse flowers, it takes on another dimension, but in the cold grey of mid-April, it all ends up feeling fairly desolate. But the people were warm and, from time to time, we would pass a car and the drivers would extend to each other the “Islay wave,” a raised index finger in recognition of one of the island’s other 3,200 inhabitants. After about 45 minutes, we reached the turnoff for Caol Ila, just before Port Askaig. As we approached, we could see the whole facility from our vantage point, high above its roofs. We followed the drive down and around to the distillery, which sits right on the water. The drive had been bumpy but relaxing and we headed in for another tour. After paying, we looked around their small shop and looked out the window toward Jura, which sits just across the bay. It’s not far and there is a ferry that will take you across in five short minutes. That said, there’s not much to do in Jura. There’s the distillery and the Corryvreckan whirlpool that Ardbeg uses as a name for one of their expressions, but if you look at Trip Advisor, the top 2 things to do in Jura are both ferries to take you off the island. The tour began and a young lady was our guide. 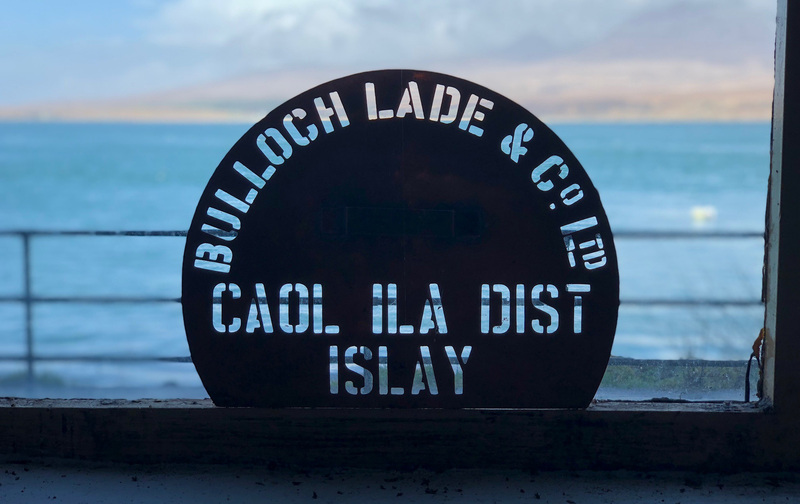 Immediately we learned something new — that Caol Ila’s spirit is only used about 15 percent for their own single malt bottlings. The remaining 85 percent is sent to Johnnie Walker for blends. Like most of the distilleries we visited, Caol Ila only operated 5 days a week. 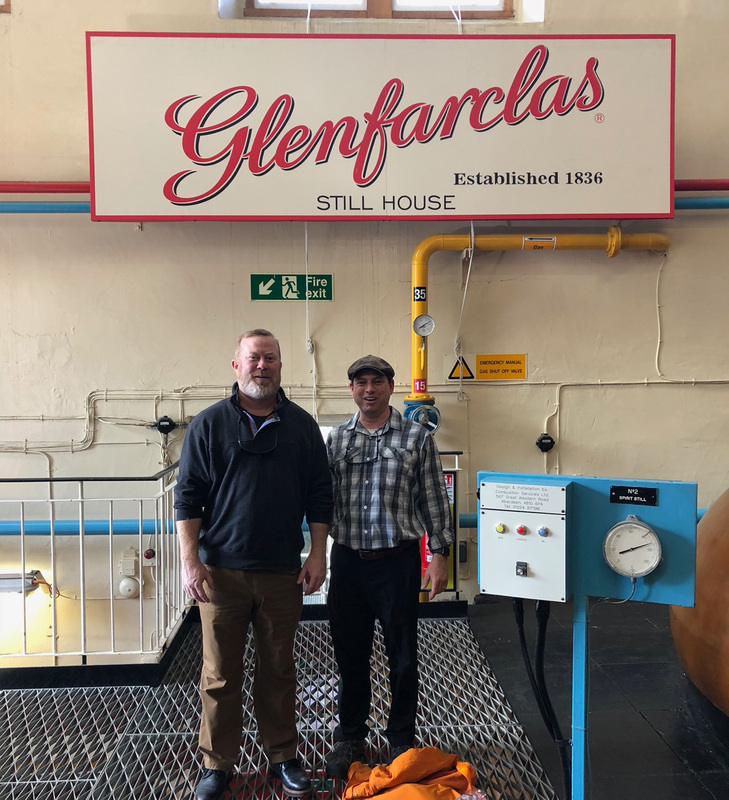 And, like everyplace we visited except Glenfarclas, Caol Ila operated a malt mill that was manufactured by Porteus out of Leeds. The machine was built so well, that many distilleries bought one and never had a need for another; they worked perfectly and never broke down. Resultantly, Porteus is no longer in business today – they were too good. Otherwise the tour was pretty forgettable. Everyone makes their spirit the same way, with minor variations, and tours end up running together unless the guide is something special, which it was not here. At the conclusion of the tour, Jon and I joined three others for a cask strength experience at Caol Ila. I didn’t remember signing up for it (not just the Lagavulin interfering) and, had I known, I probably would have chosen a regular tasting. That said, I did get to draw from the first cask and I took such a big pull on the valinch that I pulled some scotch into my lungs and it burned while I coughed it out. We had samples of four whiskies, which were enjoyable, but had to leave a little early to make it to the Bunnahabhain tour. It was a homecoming of sorts for Hughie, our driver, because he’d grown up at the distillery. His father worked the stills and he pointed out his former home as we drove into the distillery, lamenting the fact that the home would soon be scraped aside for a new version of the distillery. The location was well off the main road and, on the way in, we passed the new Ardnahoe distillery, which was in its final state of readiness before officially opening this summer. How many years you in for? As we wound our way down the hill, we caught our first glimpse of Bunnahabhain, another of my favorites. Rounding a turn, we came into view of its many buildings with casks stacked seemingly everywhere near the entrance, arranged in pyramids. Unfortunately, the day had turned grey and rain clouds loomed. The weather didn’t help the setting because Bunnahabhain had all the appeal of a Soviet gulag. Long grey buildings with small windows and many attached, featureless sheds made it feel like a prison. It may have been because of the long day, but it didn’t feel terribly inviting. Still, we gathered our rain jackets and bags from the van and trundled into the visitor’s center. Our group, including just two others, set off on our tour. We tried to be friendly with them, but they were having none of it, intent on being bitter, insulting where we were from for some unknown reason. Our guides were two young girls who were just learning the tour. They took turns reading from a sheet and it was a terrible experience, repeating themselves before having to back track. By this point, with several tours under our belts, Jon and I could both tell when they made a mistake. One thing is for certain, guides make the tour. It was boring and probably not worth the trip. Later, as we stood in the small store enjoying a taste of their malt, we were shown drawings of their new facility, which is planned to be built out in a massive £11 million upgrade, scheduled to begin soon. As bland as this day’s visit was, I’d love to come back when they have a chance to improve the facility and tour. On the trip home, we dozed while trying to keep our focus on the way back to Port Ellen. It had been a long day with a lot of whisky — even when the samples were small. 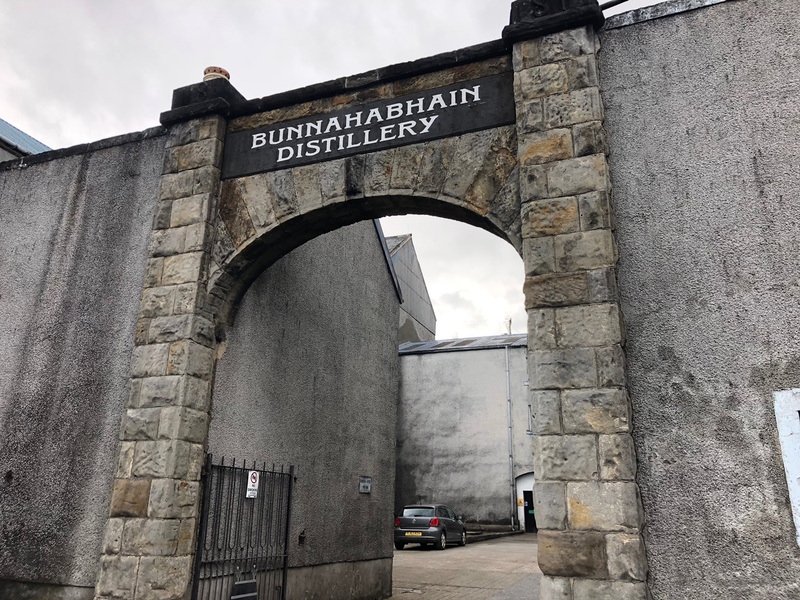 Three distillery tours in a day is probably one too many, but we were intent on visiting as many as we could in the short time we had on Islay and I’m happy we put forth the effort. The adventure and spirits helped us to bed early, which was good since the ferry left at 7am the next day. It was time to head back to the mainland. The return ferry was much smaller and not as nicely appointed, but the water was calm and the passage went by quickly. We retrieved our car and began the drive toward Inverness. Our first stop as we drove northeast was Glen Coe, which was a short detour from our route. We stopped at the park’s visitor’s center and were treated to a beautiful view of the tall walls of the glen, which wrapped all around us like a welcoming hug. Clouds shrouded the tops of the hills around us, which held on to winter’s snow in long, weeping streaks. Still, we were dry; rain had decided to take the week off in Scotland. We elected to go on a short hike along a nature trail and made our way past a couple of picturesque brooks. The highlight of the trail was a stop at one of the remaining ruins from the Glencoe Massacre. It made me realize I need to read more Scottish history, as my recollection of the story fell a bit short. As we began our walk back to the car park, a growing thunder sounded from a nearby pass. We looked on and, all of a sudden, a pair of Typhoon jets split the gap and rocketed over the visitor’s center before disappearing between more hills. It was an unexpected and thrilling surprise. 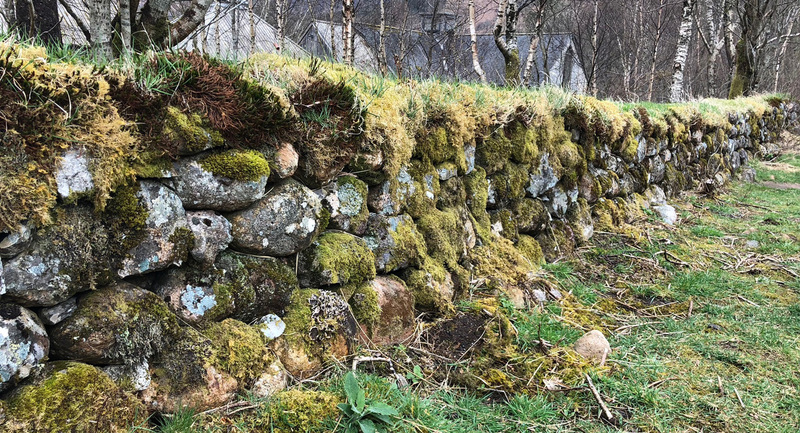 As we journeyed on, Jon called out more dry-stacked and ancient stone walls, which he had developed an infatuation for and, accordingly, he captured many in his photos. I am very thankful for his photographic catalog. It was a task that he tackled without question and it pleased me greatly since I could ignore taking photos and it’s something I’m poor at remembering to do anyway. What’s more, he has a good eye for it and I can just grab copies of his work. The images here are almost solely his. 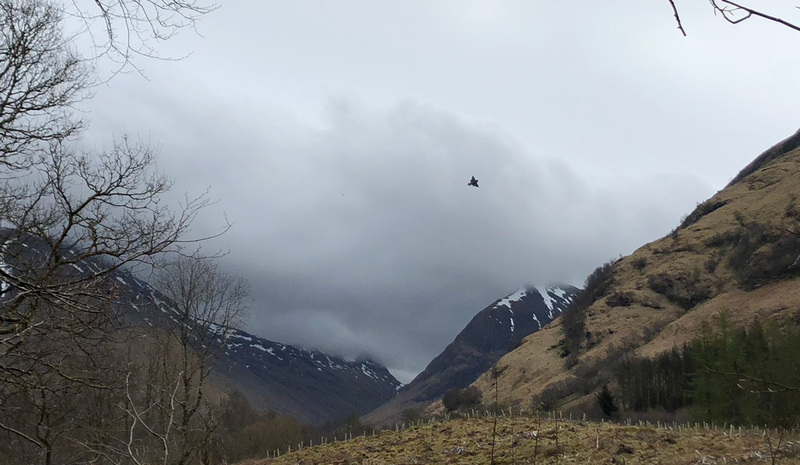 We intended to head a bit further south to see Glen Etive and the iconic view that Bond saw as he stepped from his classic Aston Martin in Skyfall, but time wouldn’t allow it and the rumor is that it’s become a soiled trash dump, thanks to inconsiderate tourists and campers. So we returned to the main road. We continued up the A82 and stopped in Fort William for lunch. Kate and I had been here before, her sister was married here in the late 90s. We found the church in the city center and were surprised that it had the same name as our church at home. 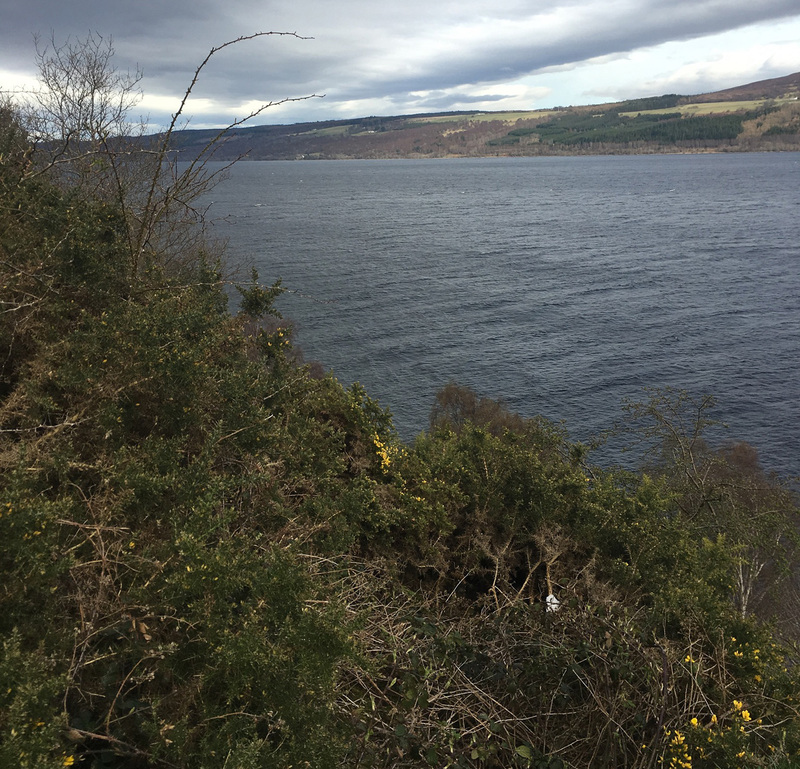 Driving on, we approached the world-famous Loch Ness and had a great discussion about the wonder and excitement that imaginative beasts like Nessie had stirred in our childhoods. 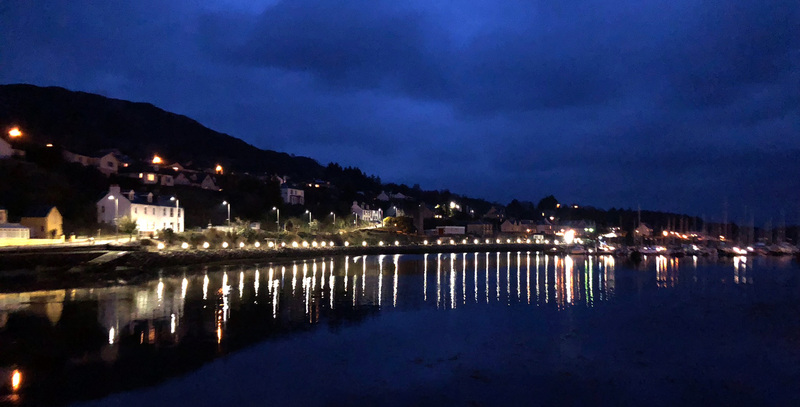 Though Loch Ness has taken a backseat in this day of intense scientific scrutiny, we couldn’t help but stop at the Loch Ness Expo Centre & Exhibition. Reliving the possibilities that were popular in the late 1970s, the visit was a trip down memory lane. (But we skipped the gift shop.) Back in the car, we drove the final stretch to Inverness where we stayed at the RocPool hotel, just up the road from Inverness Castle. It was an extravagance, but it was an elegant hotel with an excellent staff, great restaurant, and a 24-hour bar. We ate at the Mustard Seed before turning in for the night. We slept very well and it was the perfect place for the midpoint of our trip. A bar I could get to know better, The Spirt Safe at the Station Hotel in Rothes. Before departing the next morning, we mailed some scotch home, via DHL (the only carrier who will take liquids to the States) and began our drive toward Speyside. Our home base was to be the Station Hotel in Rothes. The hotel was recently updated by its owners, the Forsyths. This family has a long history in the region. One of their businesses is coppersmithing and they are responsible for many of the stills in the region’s distilleries. As a result, their hotel is clad in copper and reflective of the chief industry: their restaurant is the Pagoda and their bar is the Spirit Safe. 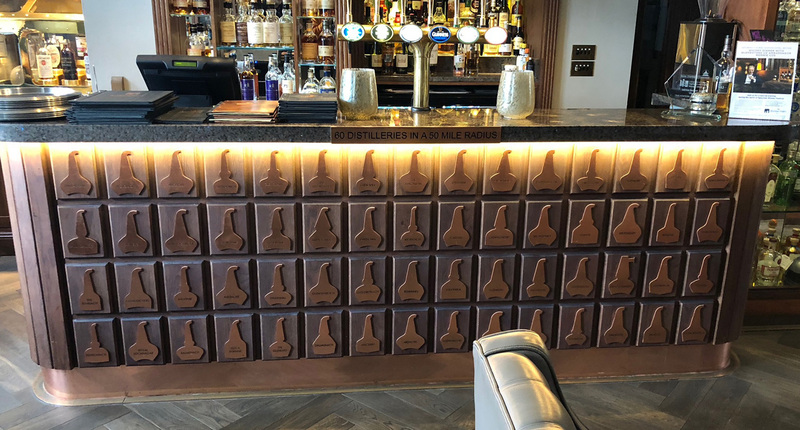 The front of the bar hosts a plaque boasting that there are 60 distilleries in a 50 mile radius and each is represented by the unique shape of its still on the front of the bar. We highly recommend the hotel. With a bit of time to kill, we dropped our bags and walked up to Glen Grant, which wasn’t on our itinerary. But it was close and we had an hour or so until we needed to leave. The distillery is nestled in a small glen and, at its rear, has a beautiful garden. We walked its paths, enjoyed the running water of its water source and smelled the flowers. We had a few minutes left before running to catch our taxi, so we stopped for a quick tasting. 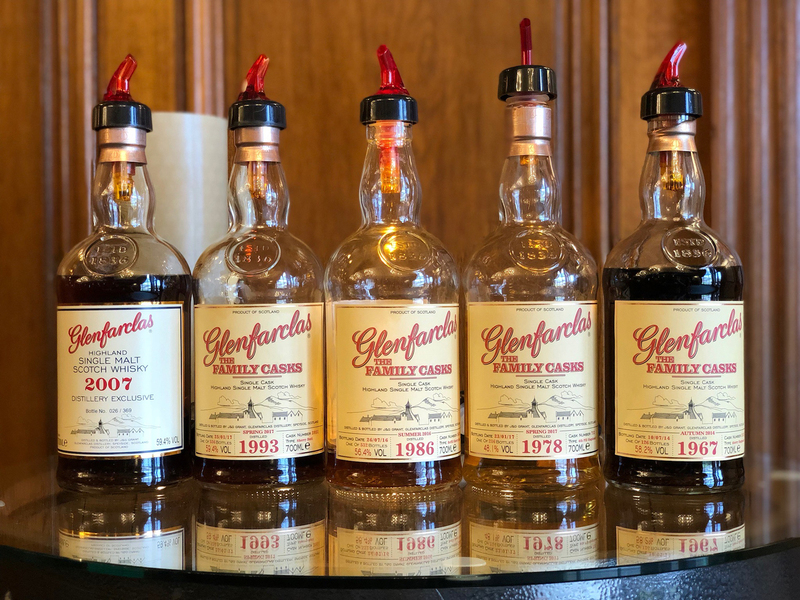 Jon and I went on to Glenfarclas to take their Five Decades tour. Our guide was a man named Steve, who had been a former school teacher. He was the best guide we had, his voice was booming and loud so we could hear everything he said. He was good spirited and quite funny, so the tour was very enjoyable and he loved scotch, so he was enthusiastic. The location for the distillery is a bit out in the open and, if I recall correctly, they are dependent on rain and snow run-off for water. Occasionally, the distillery has to shut down if the water dries up. After an outstanding tour, we were fortunate to sit down for the Five Decades testing. This is an opportunity that’s only offered a couple of times a month, so we were treated to a luxurious variety of malts, taken from the Grant family casks and, as you may have guessed, spanning five decades. The experience was fantastic. That was it for the day, just a single, relaxing tour, which was far more manageable than trying to hit a huge number in one day. On our final day of distillery tours, I arose early. I walked out to find an ATM and get a bit of cash to pay for the day’s taxi. Everyone else was still asleep when I got back, so I grabbed my book and enjoyed some coffee and quiet in the restaurant. Mid-morning, we headed over to The Balvenie for their tour. The ladies joined us for this last day and we were joined by 2 other couples for our tour. Our guide, Charlie, was very educated in scotch and The Balvenie and was an excellent guide. He had answers to all of our questions and is an outstanding ambassador for the brand. 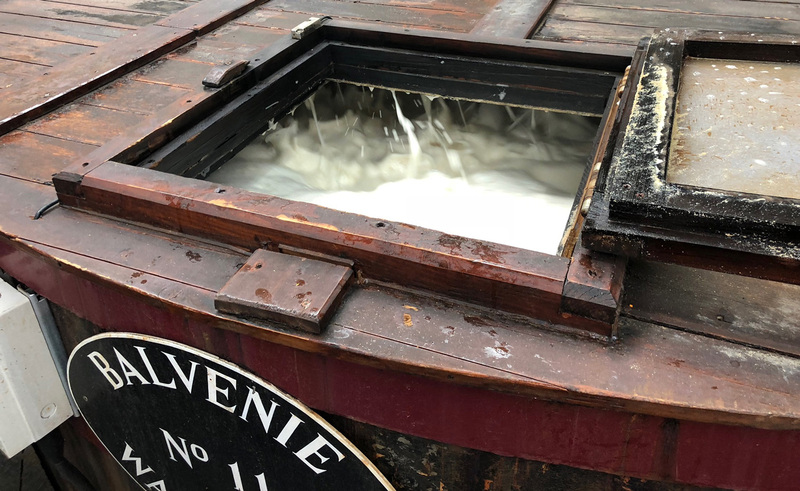 While much of that tour was like many of the others, The Balvenie is the only distillery we visited to employ its own cooperage. We spent about 20 minutes watching them work and it was absolutely fascinating, watching the various machines and tasks, while we tried to work out their processes. Each man was responsible for repairing about 10 casks a day and, given the thousands of casks waiting for attention on the grounds outside, they have their work cut out for them for a long time to come. Our last stop before tasting was one of the warehouses, their showcase Warehouse 24, which was formally a home when the land was originally purchased for the distillery back in the late 1800s. Inside this warehouse is the well known Tun where master distiller David Stewart crafts his coveted limited edition whiskies. On the second floor, we were given tastes from three casks, but not from glasses. We were invited to pour a small bit in our hands and slurp it from our palms. Quaint, but mine ended up tasting like the scented hand soap I’d used recently. This tour allows its visitors to bottle their own whisky from one of these three casks but we opted out because we only had carry-on bags and didn’t want to trouble with shipping more things home. Next, we gathered around a round table and had our tasting — five different expressions, each of which was readily available at retail. I’d had them all before except the Port Wood 21, which wasn’t my favorite anyway — scotch heavy with port flavors is not my thing. However, I am pretty crazy about their Caribbean Cask, aged 14 years, and that was on the menu. We also got to taste their uncasked spirit, white whisky, unaged and straight from the still and it was uniquely floral. Additionally, since we had signed up for their membership program, we were allowed a sample of a 1982 36-year-old at cask strength. Yum! 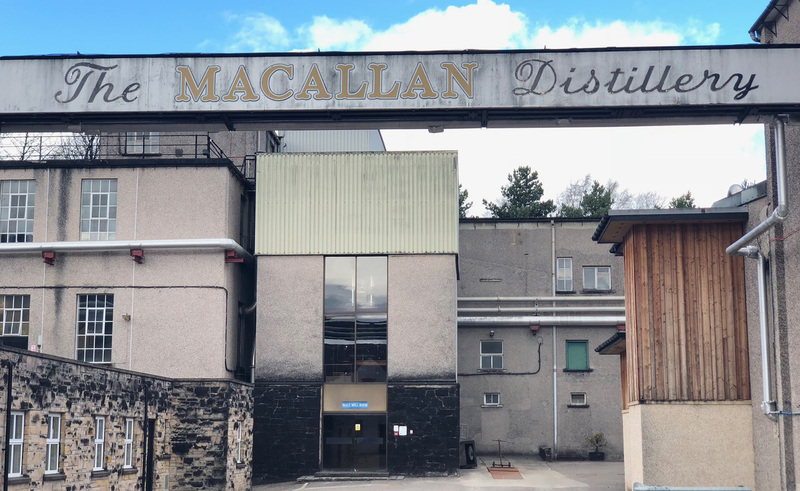 As enjoyable as the tour and tasting were — really very wonderful — we had to cut them short to catch the last tour of our trip, at Macallan. While I don’t have anything against Macallan, I can’t say anything overly positive about their brand either. It’s not a dram I’ll drink very often and it’s fine to taste when I do, but it’s just not for me. We had scheduled Macallan just to get a sense of what a huge distillery is like. The decision ended up being fortuitous because we were there for the last days of the old tour. The facility was shut down as production shifted from their older tuns and stills to an entirely new facility — one that’s located underground like some crazy Bond villain’s hideout. The tour was boring and sterile, essentially explained through a series of posters in a showroom built for tourists. While touring other distilleries, we were clearly in the rooms where the spirit was truly being created, but not here. At Macallan, it felt like the curtain was only drawn back a wee bit before being ushered into the gift shop. Once again, no photos allowed. 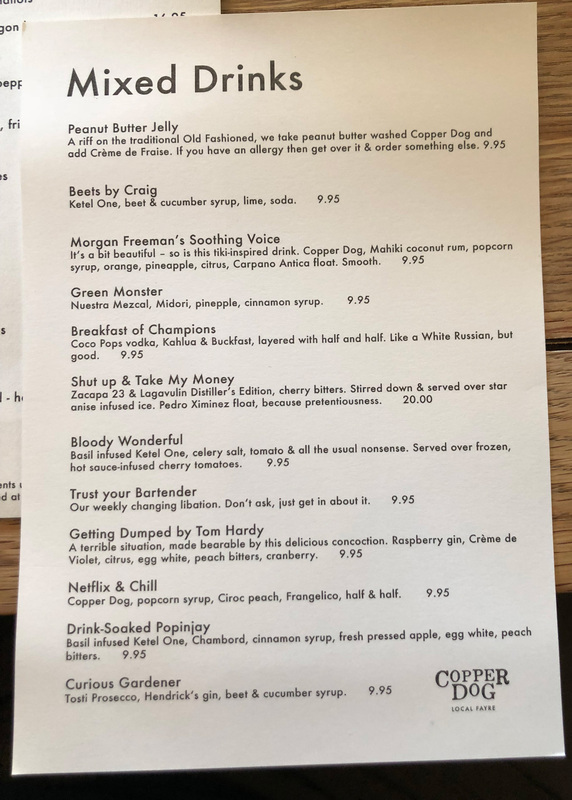 We ended our last day in Speyside by enjoying a great meal at the Copper Dog, which had one of the best drink menus I’d seen in a long time, full of courageous offerings and ripe with humor. Jon really liked the mashed peas. He wanted me to mention that. Our last full day began with a drive to Edinburgh. 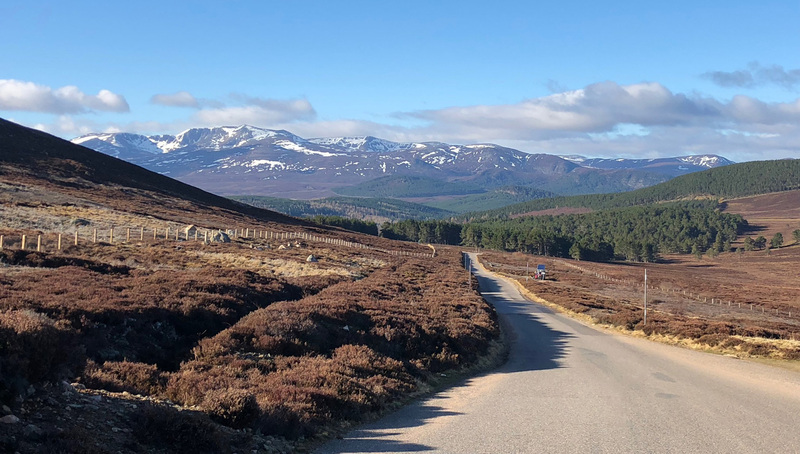 Putting our trust in the car’s GPS proved foolish, as we cut a sweeping corner across Cairngorms National Park, much of it on single track, over high mountain passes and through desolate glens and plains. As the environment radically changed from one moment to the next, it was stunningly beautiful, but not the fastest way and tacked about an hour on to our drive. We passed a couple of ski areas along the way, as well as campers awaking from a night’s slumber. There was an abundance of hares being brave and running across the road and, as we neared the end of our trip through the park, we saw a small herd of tall-paddled fallow deer. In retrospect, maybe the GPS did know best. It was a breathtaking drive and an excellent way to begin winding down our trip. Arriving in the capital city, we stayed at The Scotsman, a hotel located in the old home of the national newspaper. The staff was superb, but there was no parking and I had to drive the car to a car park about a quarter mile away, past several turns and down one-way streets. It required the assistance of one of the hotel’s porters to guide me and was the most convoluted solution for parking I’ve ever encountered at a hotel purporting to be a luxury stop. For that and several other reasons, we’d not recommend it, but it was just one night. 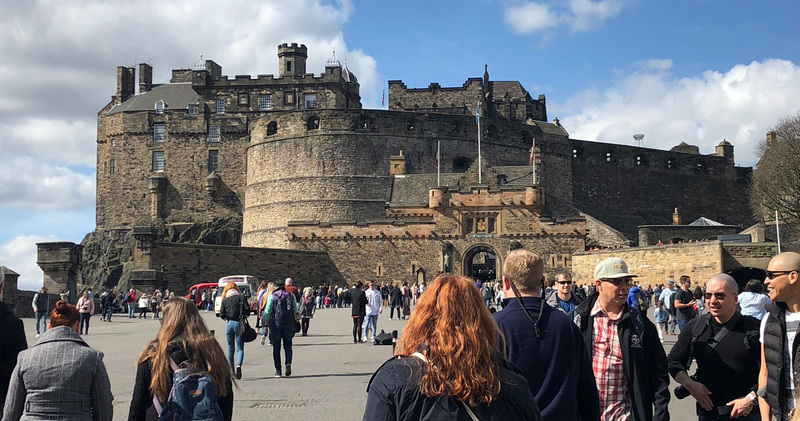 Regardless, like most visitors to the city, we walked up the Royal Mile to visit Edinburgh Castle before making our way back down, shopping for souvenirs along the way. Early Sunday we headed for the airport, getting lost and making a few illegal turns on the way. (Thank goodness for light Sunday morning traffic.) Then it was dozing, movie watching, and book reading until we arrived home, somewhat exhausted, but none the worse for wear, eager to shower and get to bed. It was an outstanding vacation and one I would take again at the drop of a hat. I would have booked taxis ahead of time. Some places only had two taxi drivers for the entire region and, while we were able to always get rides, we were lucky because it was early in the tourist season. If we had been any later, we may have not been able to get a taxi to take us around and might have missed pre-paid tours. I’m used to being in big cities where there is an ATM on almost every corner. In smaller cities and on Islay, ATMs are few and far between (and not all of them accept US cards), so I would have done a better job of having cash on hand. The tour guide was the difference between a boring tour and a great one. 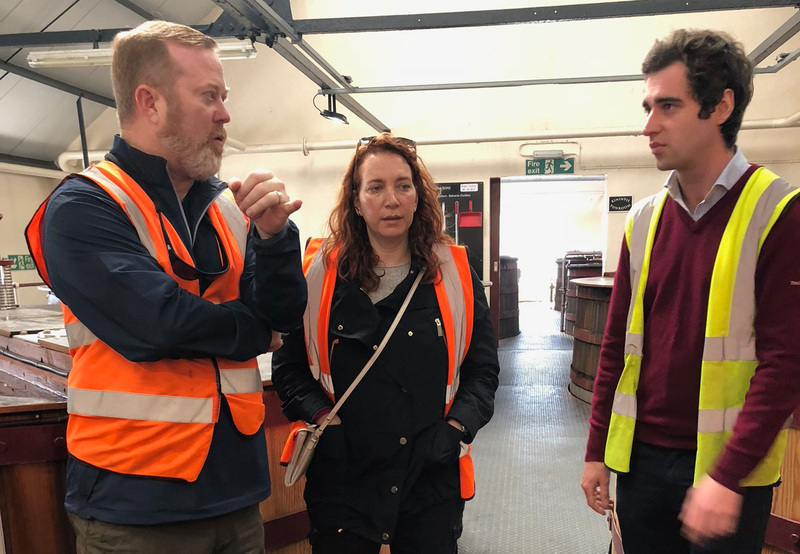 We were fortunate to have several very, very good guides like Gail at Laphroaig, Steve at Glenfarclas, and Charlie at The Balvenie. Scotch tourism is a newish phenomenon and, hopefully, distilleries will catch on. Average or poor tour guides can effectively ruin a visit. Charlie, our excellent tour guide at The Balvenie made an ordinary tour into an excellent one. 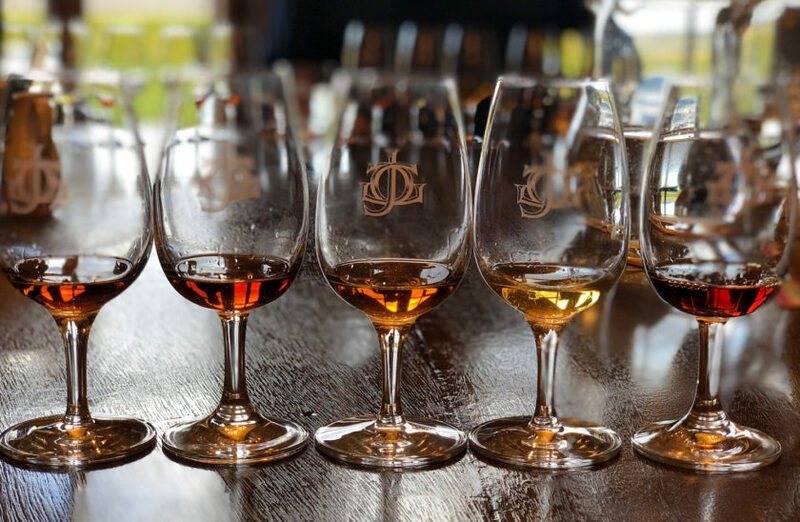 While I appreciated visiting a variety of distilleries, all the tours end up being very similar, since everyone makes scotch pretty much the same way. If I were to plan a scotch-themed trip again, I would try to schedule other visits, perhaps of ancillary services. 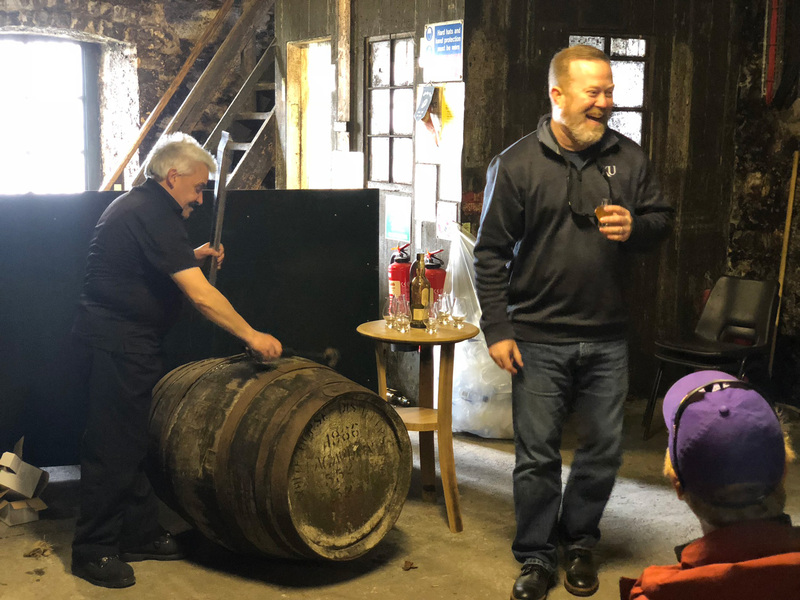 For instance, we enjoyed the cooperage part of the tour at The Balvenie, but nearby there is a full business devoted to cooperage that also has a tour. That might have been an interesting use of time. Nearly all distilleries bottle in Glasgow. I’d be interested to find out if I could see that part of the process. With the exception of Lagavulin (and then, only because Iain McArthur is so entertaining), I would have avoided cask strength tastings. For my personal taste, it’s just too strong and not nearly as enjoyable as a whisky that has a lower ABV. It’s worth noting that all tastings also provided water. When traveling through Islay, Speyside, and the rest of the Scottish countryside, everything feels like it has been touched by scotch. 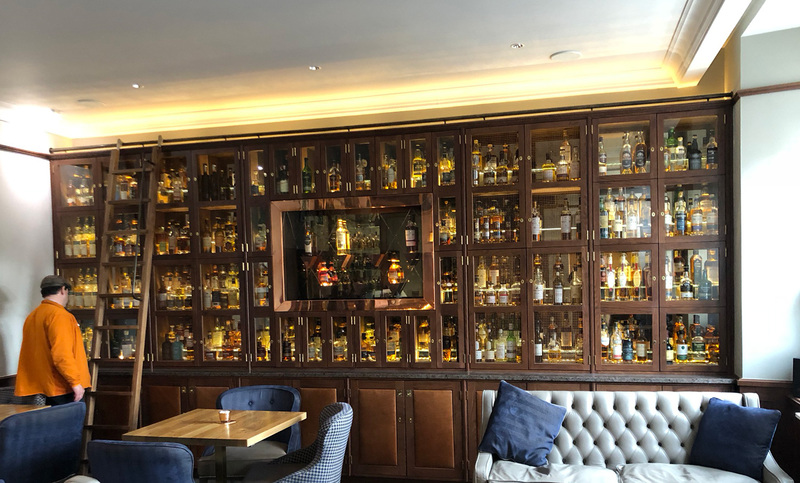 It’s such a huge part of the country’s heritage and, checking into our Edinburgh hotel, the first thing I was asked by the bellman was if we’d had the chance to find any scotch on our travels. Simply put, scotch’s influence can be felt throughout the entire country. Thanks to that, I am glad we chose to do this trip and have a better understanding of how scotch is made and the small differences that affect taste. It was a great trip. For the record, the greatest scotch I’ve ever tasted is a 1968 Bunnahabhain, bottled at 45 years. On the nose, it’s light and it coyly flirts with hints of what’s to come. But in the mouth it opens like a luxuriously warm blanket, wrapping your taste buds with an elixir stolen from the tables of Valhalla. Rich honeys and soft spices step spritely in pairs with tobacco smoke and just a hint of freshly picked mint. It’s the kind of imaginative hyperbole usually reserved for wines from Bordeaux and Burgundy, but the rewarding taste of a really good scotch can move anyone to poetry; no matter how poorly done.